Easily accessible, the Principality of Monaco offers an exceptional life-style at the heart of Europe and the Mediterranean bassin. Among the many aspects which make Monaco a strategic location for doing business in Europe are its unique political and economic environment, the presence of efficient administrative infrastructures, the density of financial activities and the security for residents and their property. What is Monaco's current fiscal regime ? What are the legal aspects of investment in Monaco ? for an investor who is choosing between several possible location sites. 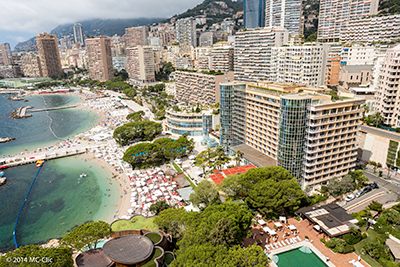 Follow the guide for a better understanding of the legal and financial aspects which make the Principality not only an attractive vacation spot, but also a recognized investment capital. Moreover, the Principality of Monaco is an ideal living environment for highly qualified professionals, offering a pleasant and prestigious life-style , total security for themselves and their property, a socially and culturally diverse atmosphere, numerous education possibilities, for their children and technologically advanced health facilities. In short, a life-style that is difficult to turn down, even for the most exacting individuals. With 37 banks, and more than 42 portfolio and mutual fund management companies, the banking sector constitutes a large part of Monaco's financial activity. The Monegasque government actively combats money-laundering and numbered bank accounts are illegal. However, bank confidentiality is one of the main principals of Monegasque banking. Monegasque banking establishments are not only capable of managing international assets, but also offer comprehensive services to companies in the Principality (including helping companies to obtain financial ressources from a special government fund). The lifestyle, security, political stability and the fiscal advantages have made Monaco an attractive location for exacting investors. For more information on the banking sector and its services, please consult the Banks directory of Monaco. land remains rare in the Principality. The amount of space available remains limited despite the numerous technological innovations helping to expand the Principality's territory. More than half of the investment in Monaco are made by non-residents who plan to live in Monaco only temporarity French nationals wishing to take advantage of the inheritance tax laws are a significant part of this population. For more information about real estate in Monaco, consult real estate professionals. The Principality of Monaco has a diversified economy. Because of its location and its unique fiscal environment, service sector activities and value-added industries are the most representative in the economy of Monaco.